I did not sleep well. The bed was way too soft. For thirty bucks you can’t complain however. I shared the dormitory with somebody else. He didn’t say one word. I get up in the morning at five and start hiking a quarter hour later. After a road walk I finally get some real trail – for half a mile. Then there is the first sign: “Trail closed because of avalanche danger!” I can’t believe it. It is summer, the grass is knee-deep, there is no snow in sight. I assume, they were simply too lazy to remove the sign. There is a second sign: “Trail closed because of winter”. Then the trail is barricaded with a band. Everything so far looked somehow old, but this barricade is recent. Now I am in trouble, there is no alternate at all. There are footprints however, so I dodge even the barricade. Then I see why the path is closed: there is a steep downstream, no bridge over it but some leftover snow from winter. If you don’t take care you will likely slide down for some 50 meters into a river. If I fall to death my boss has to run his restaurant by himself I think. His wife does the waitering but she struggles. They both would not be happy. I take care and after just two steps I am on the other side. The next stream, the same game: No bridge, but this time all that is needed is a jump under one meter. I manage to do it just fine and then I am nearly in Göschenen. I am a little bit disappointed that they don’t show the Devil stone near Göschenen, just as I see a sign to a vantage point for just this stone. By now the trail follows the railway. You have to walk through all kinds of tunnels and bridges. I can’t find the vantage point as the path to it isn’t maintained but I manage to get a picture from the stone. My grandfather used to tell the story about a can on top of the stone. Every time somebody climbed on top of it, he would find a message and money, so he could repaint the small flagpoles. I guess this story was invented by him. The stone however was moved because of the construction of the motorway. Then there is Göschenen – a town frozen in time. A huge railway station, deserted, a hotel where trees grow out of the balcony, closed down for decades. There is a sign about the construction of the first railway tunnel and it makes me angry. Some of the women present in Göschenen during construction time are referred to as “service girls”. What kind of service did they provide? Maybe sharpening the hammers used by the tunnel workers? Ironing the clothes? Be real, no euphemisms please. When they used steam powered trains, they already used electronic power for signaling purposes. This is a so called cable house. I continue in direction of the Schölenen gorge. There is construction everywhere. Apparently, they are building a separate street for bicycles. 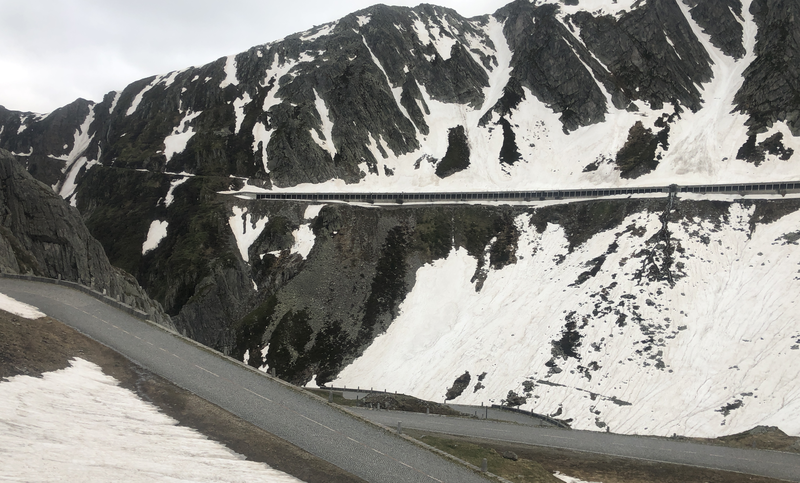 It is great fun to cross the Gotthard pass by bike, not so much fun is the motorized traffic. Rebuilt bridge from the 15th century. The original bridge held until 1987 when the river washed it away. Because of the construction there are no way signs and I pass through active construction sites. They are working even on the devils’ bridge, so I have to use a small tunnel from the second world war. There is no light in it, doesn’t matter, I carry two headlamps. The workers seem to be disappointed that I made it through the tunnel. 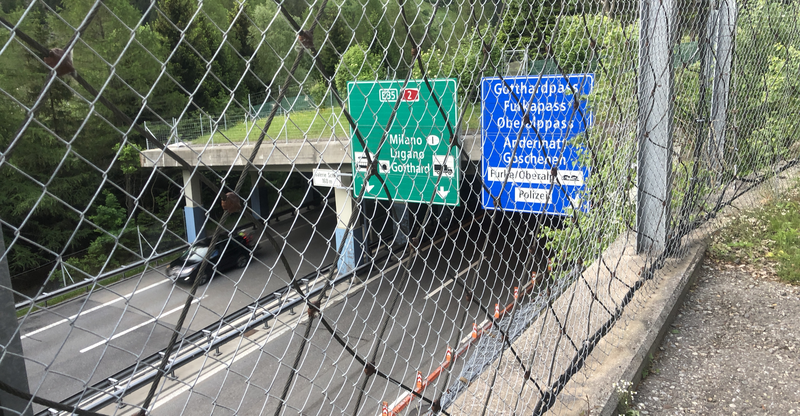 Later, in Andermatt I see a sign: The way down the Schölenen will reopen on the 27th of Mai because of construction. Good to know, today it is the 28th and there was no word nowhere coming up to here, that the way may be closed. In Andermatt there is also construction, this time for an investor from Egypt. He plans nothing less than to build a copy of St. Moritz or Gstaad. If you were in these places you will laugh about the idea to copy them in Andermatt. Regardless of how many billions you invest in Andermatt: The problem is the topography. Andermatt is between north and south the weather changes every hour for about four times. Andermatt itself is located at the end of a high plateau which is again like a wind-tunnel and down in the valley, so you have a natural cold air lake. Nevertheless, they replaced the military training grounds with a 18hole-golfcourse and they invest dozens of millions in new skiing infrastructure – in a time where others start to remove their lifts, because of no more demand. It is only my education that keeps me from shitting right on the golf course. It would disturb nobody as there is not a single golfer in sight. I am not sure if this golf course or the entire resort will make it over time. Already the next town, Hospental seems to be much friendlier. 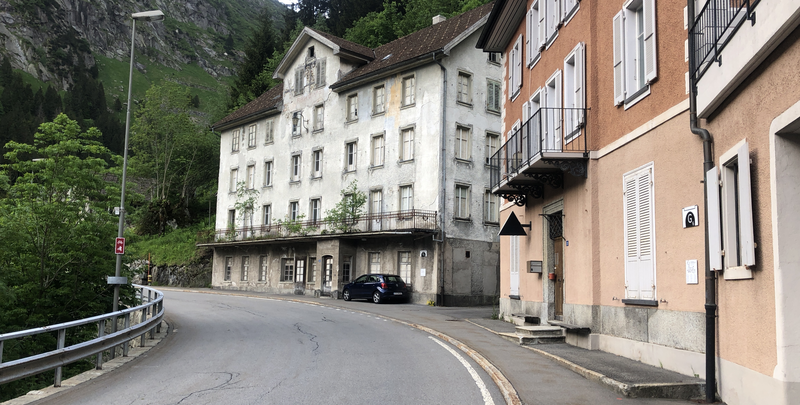 I understand everybody who is happy about having work in Andermatt and in the canton of Uri but there is not a single resort in the European alps that worked. As children, we were often in St. Moritz although my parents were not in the kind of income category who would have allowed us to spend our holidays there. Instead we often cross-country skied there. It is incredibly beautiful. From Hospental, I follow the old pass road and soon I am on the next high-plateau. The weather is not friendly, there is wind and dark clouds but no rain. Through cow swamp from last year, here and there the really old trader way over the pass is visible – used since centuries. Then there is snow and I have to mount my micro spikes. There are still traces from somebody before me. There is a giant air installation for things inside the Gotthard. Maybe the tunnels or the massive military forts. My grand-father spent his active duty during world war II in the Gotthard. The old path suddenly disappears into a stream and I have to climb up to the new pass road. Doesn’t matter the old road is close by, so I can use it. Motorists overtake me in fancy cars, clearly tourists, I am not sure, if the old road is still open for cars. They all stop at a point in the distance. Then they come back. As I reach this point I see why: 15 feet of snow. Doesn’t matter, I can go around this snow barricade. On several points the traffic barriers on the side of the new road are smashed from the winter. Construction crews are already replacing the defective parts. I follow the old pass road as the hiking path is buried under snow. There are military installations here and there, including a bunker with armored turning towers. Built in 1943 and already obsolete before the first pen strike was done. During the first world war this kind of bunkers had proven their ineffectiveness in war. The enemy will eventually find out where this bunker is located. After some snow walking I reach the hospice on top of the pass. Everything is a little bit run-down, apparently, they are preparing for summer season. The restaurant is closed but they have small food shops on the outside. I am the only hiker. I eat something and continue down. There are no footprints this time, the hiking path is not visible. Here and there, however, the markers of the old road are visible. That’s enough for me and my micro spikes. I basically run over the sometimes-steep snowfields. The marmots are already out I carefully avoid them although they seem to be used to humans. Sometimes they don’t care at all and continue doing their thing. I move quickly as sometimes the road is covered with fresh avalanches or stones and mud. Everything goes well, I just slide in the deep mud in a cow patch. And I rip my shorts on a traffic barrier. 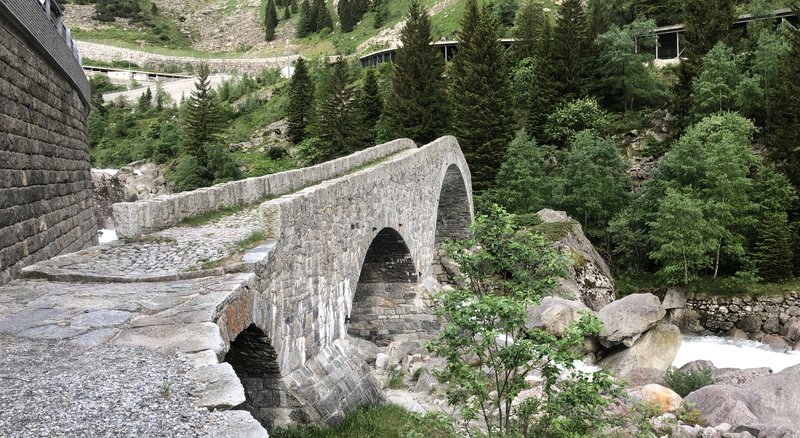 The Gotthard may be a place of national importance, to cross it over the pass by feet is not that difficult. Although I am sure now, that I was the first one who crossed it this year without skis. There were no footprints at all on the southern side. So, I reach Airolo and start the Leventina. There is the strada alta, which stands for high road and the planers of this trail have decided to route it over this road. It was not the smartest idea because roads nowadays tend to have hard surfaces. I follow the road-path until I take a path down to Faido. Apparently this strada alta is in use since centuries because earlier, people could avoid the dangerous river down in the valley on this route. Nowadays the path or road unfortunately leads you along holiday homes, many are for sale. The motorway down in the valley is audible all the times, there are aggressive dogs and run-down farmer buildings. If you are interested in buying a hotel you have some choice here. Just make sure the building is not collapsing over you. I have to work the next day, so I have to catch a train back to Zurich. The entire strada alta is 45 km or 27 miles long. Due to my time constraints I could not do it in one go. I am happy with my form as nothing hurts even after two days of mainly road walking for long hours. Now I have just to go from Faido back to the strada alta and tackle the rest of this strange trail.